I stand there for several moments with my key in the lock, something like guilt fluttering behind my ribs. It fades as fast. I remind myself that Returning is merciful. Returning puts them back to sleep, ends the nightmare of their ghostly walking. Still, I hate the fear that laces the younger eyes when i lock them in. I would give anything to be normal. The thought creeps in, and I force it away. No I wouldn't. I wouldn't give anything. I wouldn't give the bond I had with Da. I wouldn't give the time I have with Ben's drawer. I wouldn't give Roland, and I would give the Archive, with it's impossible light and the closest thing I've ever felt to peace. This is all I have. This is all I am. "I could go with you, for protect-"
I lift the sponge. "Finish the word," I say, ready to pitch it at his head. To his credit, he backs down, the sentence fading into a crooked smile. It's a damn dirty shame that The Archived series doesn't get more recognition. This amazing story is beautifully told . . . amazingly beautiful. How's that for adjective usage? After the tragic death of her 10-year-old brother, Ben, Mackenzie's parents move them to The Coronado, an old hotel converted to apartments in 1950. 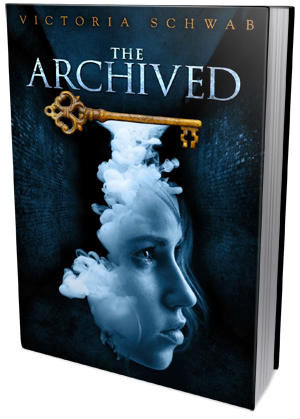 Once there, Mackenzie begins searching for doors that will lead her to The Narrows, where she can return Histories, and The Archive, where the histories are stored. I'll admit that I was a little confused about the work of a Keeper in the beginning, but it was very easy to catch on to what Mackenzie did. I especially liked the second person flashbacks between Mackenzie and Da. The purpose of these flashbacks were threefold really. Victoria added depth to Mackenzie's character, allowed us to learn about Da whom was an integral part of Mackenzie and her past, and learn more about the world that Mackenzie inhabits. It's a truly fascinating world at that. Once people die they are shelved in The Archive. Most people stay "asleep," but every once in a while they will wake up and break free. When that happens, Keepers return them through doors in The Narrow. There is also Crew, who tracks down Histories who escape the Narrows, and Librarians, who maintain The Archive. It's such a fascinating concept and helps to make The Archived extremely unique and enticing. Roland is above and beyond my favorite Librarian. You can tell he really took over Da's role when he died. He protects Mackenzie, vouches for her, gives her advice, and is the perfect father figure for this part of her life. There are so many twists and turns within this novel that there is no possible way to be bored. The mystery was equally fascinating and mind blowing - especially once everything came out. I never saw it coming - and that is a testament to Victoria's amazing writing and story telling. This is my first encounter with Ms. Schwab and I can promise you it certainly will not be the last.